The majestic sheer walls of the Cliffs of Moher may be County Clare’s most famous scenic attraction, but when you visit you will be spoiled by a wealth of breath-taking scenery, great natural wonders, ancient castles, charming towns and villages, relaxing pubs, exceptional traditional Irish music, and invigorating outdoor activities. The people of Clare are laid-back and welcoming, making Clare a county to fall in love with. 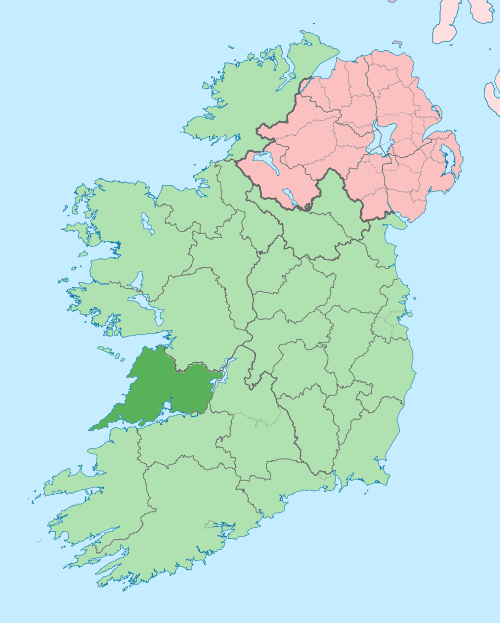 County Clare, one of the six counties of the southern province of Munster, is the only Munster county lying west of the river Shannon. The eastern county boasts rolling hills, forests, verdant fields, beautiful lakes and streams – a bounty of serene, peaceful scenery. The western coastline is in sharp contrast, dominated by the rugged beauty of wind, rain and wave lashed cliffs and beaches. The first glimpse of Ireland for many tourists is framed by a small window as their plane approaches Shannon Airport in Co. Clare. The rising sun tinges the patchwork fields in the the shadowy glow of an Irish morning, the countryside embellished by a pink, pre-dawn radiance. Then again, you may not be so lucky! 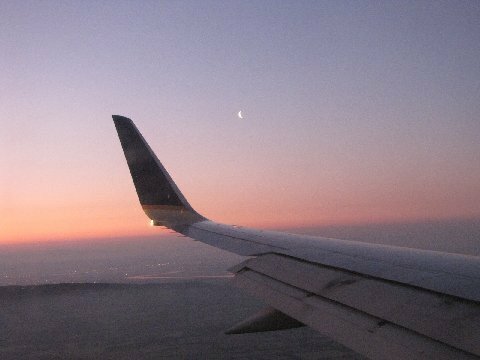 You may be greeted by lashing rain and low lying clouds, limiting your view to the airplane’s wingtip. I hope you are lucky enough to experience the magic of landing in the emerald isle on a glorious, sunny morning. Shannon is the first port-of-call for many, and a perfect spot to begin touring County Clare and the rest of our beautiful island. 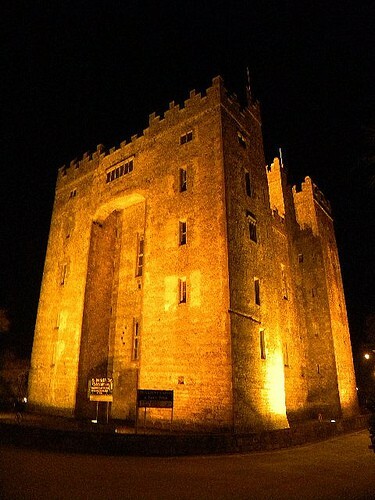 Bunratty Castle lies just a few miles east of Shannon airport. It is Ireland’s most complete and authentic medieval fortress. It dates back to 1425, but was fully restored in 1954. 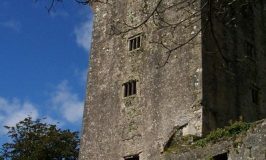 Tourists can enjoy castle tours, beautiful gardens and a medieval banquet hosted by the ‘Earl of Thomond’ each evening. This is a dinner experience not to be missed. If planning to visit by day, plan on arriving early, since the castle closes each day at 4 pm to prepare for the evening’s entertainment. Bunratty Folk Park gives the visitor a glimpse of Ireland’s past. 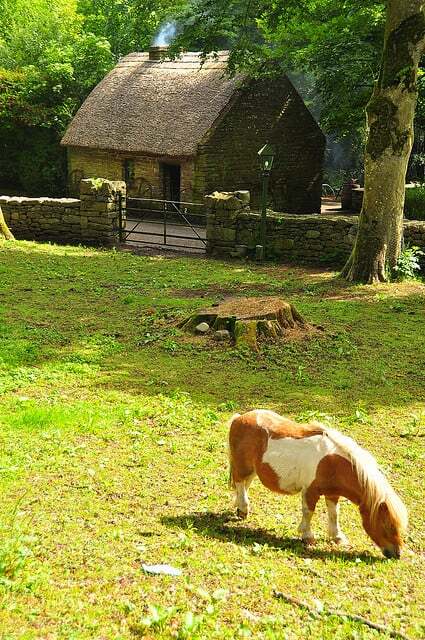 This reconstructed 19th century Irish village brings to life a rural Irish existence from days long gone. 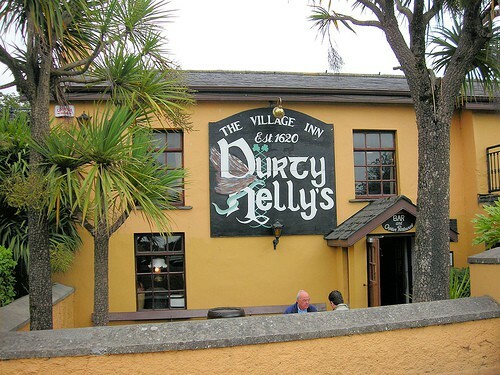 Durty Nelly’s, lies in the shadow of Bunratty Castle and is one of Ireland’s most famous pubs. Dating back to 1620, Durty Nelly’s offers a unique Irish pub experience with traditional music 7-nights a week. 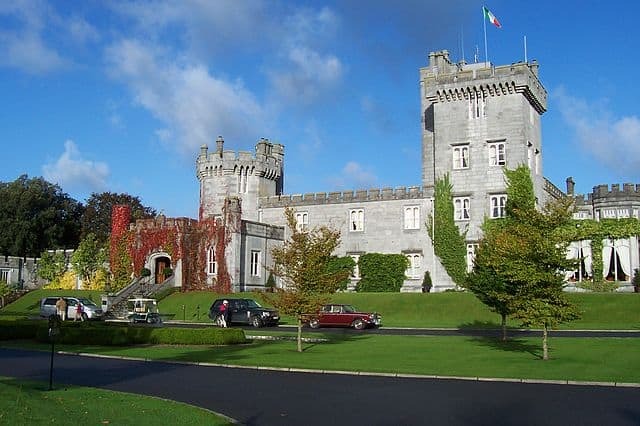 Dromoland Castle is a luxury, 5-star hotel with an excellent golf course, situated just a few miles north of Bunratty. The ancient home of the O’Brien clan, the current building was finished in 1835. A castle has been located at this site since the 15th century. The Shannon river borders County Clare to the east. 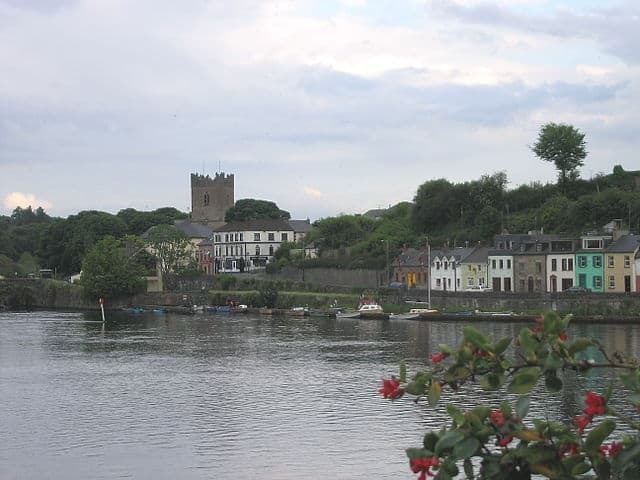 Killaloe is a beautiful town from which to explore the delights of the river and nearby Lough Derg. The town is home to the Brian Boru Heritage Center, which celebrates the life of Ireland’s greatest High King. 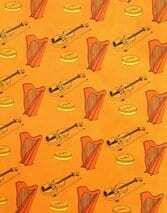 He was a native of County Clare and defeated the Vikings at the Battle of Clontarf in 1014. 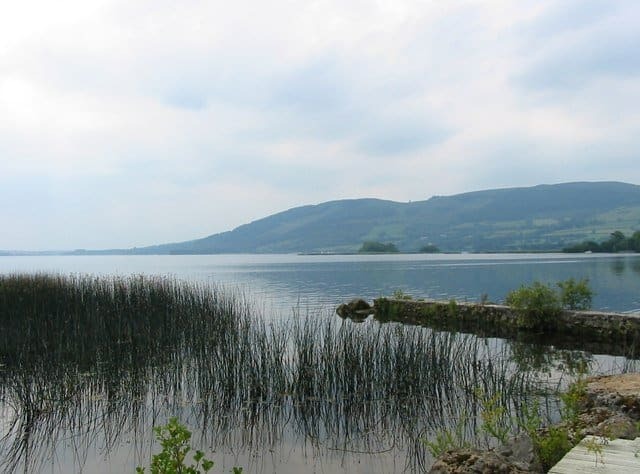 Lough Derg is a large lake on the Shannon river and offers a wide variety of watersports, cruising and angling. The lake is surrounded by beautiful countryside, with trails perfect for walking, cycling, and horse riding. 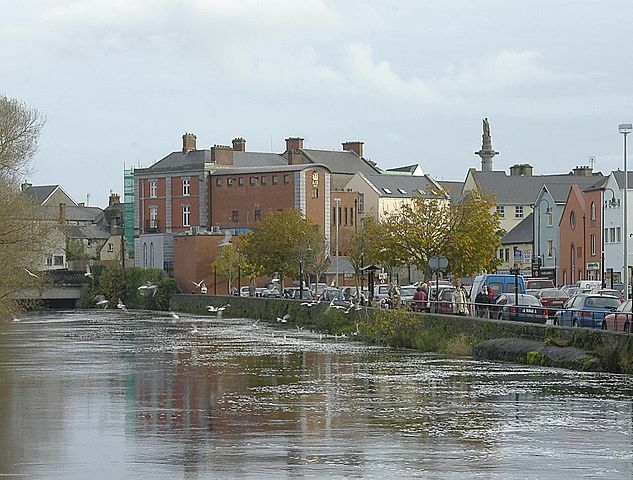 Ennis, Clare’s largest town, is located in the center of the county, making it the perfect base for touring. 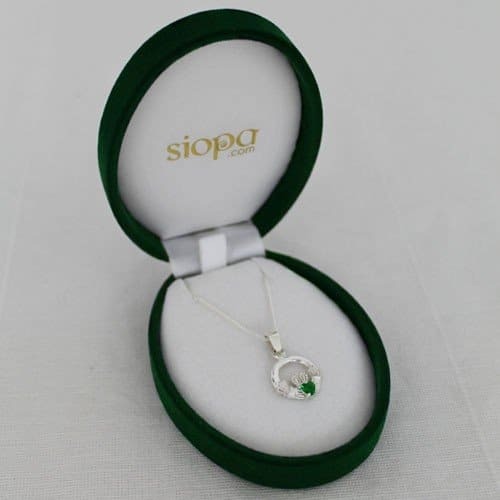 It offers a superb range of hotels, guest houses, restaurants, and unique shopping. 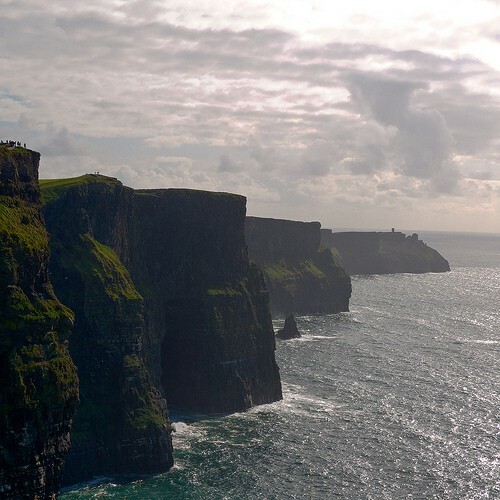 The Cliffs of Moher is one of Ireland’s most visited tourist attractions. Rising 700 feet above the Atlantic ocean swells, a walk along the cliff’s edge path is not to be missed. If you look closely at the top left corner of this photo, you will see a group of tourists standing at the very edge. 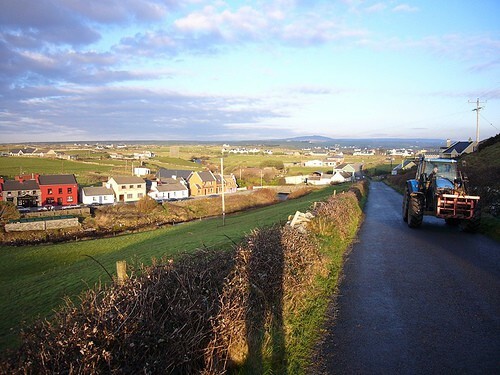 Doolin village lies just north of the Cliffs of Moher and is renowned as the traditional music capital of the country. 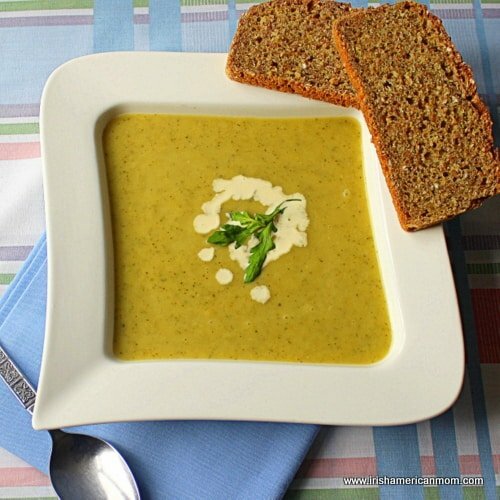 Doolin’s pubs offer a warm welcome to visitors. Ferries are available to the Aran Islands which lie to the west of counties Clare and Galway. 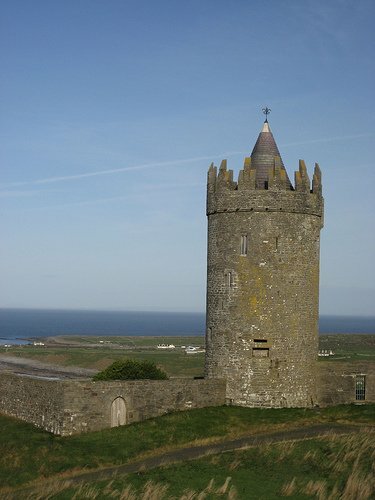 Doonagore Castle in Doolin is a 16th century tower house built overlooking the great Atlantic ocean. 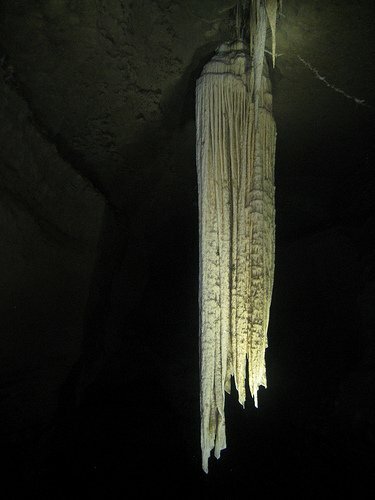 Doolin Cave is open to the public and is home to The Great Stalactite, one of the largest known stalactites in the world. 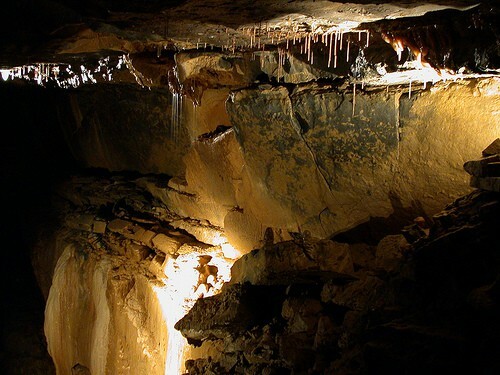 If you enjoy geology and caves, Aillwee Caves in the heart of the Burren are amongst Ireland’s oldest caves. Expert tour guides educate visitors on Ireland’s underworld. 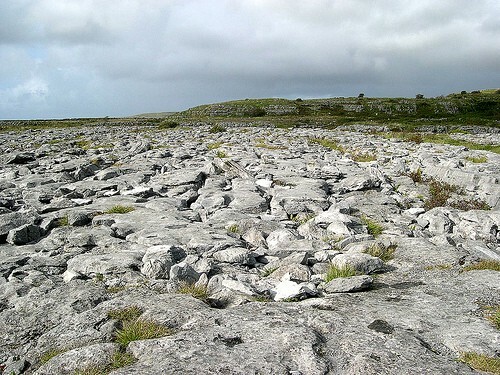 The Burren is an area of limestone rock in paving formation which covers imposing mountains and valleys. Gray limestone hills against an ocean backdrop create a truly breathtaking panorama. 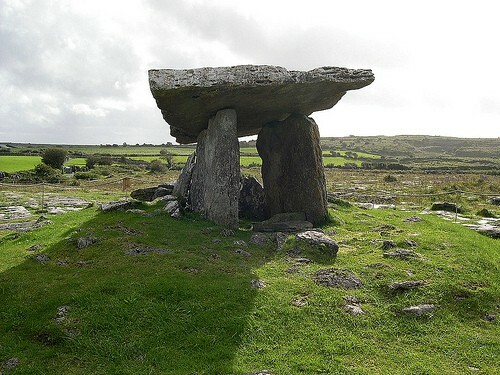 Megalithic tombs and monuments dot the countryside of The Burren. Many are older than the Egyptian pyramids. The tapestry of colors within the Burren is spectacular. 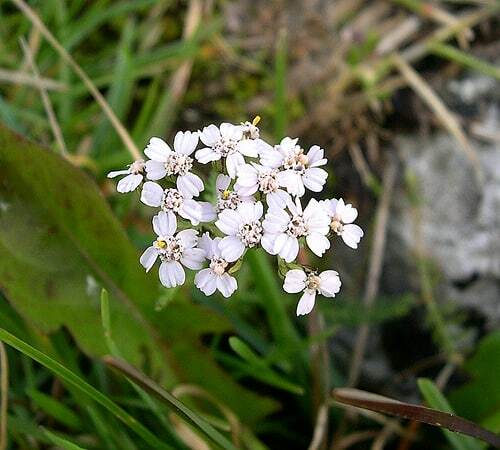 It is home to many unique wildflowers, found only in this part of Co. Clare. 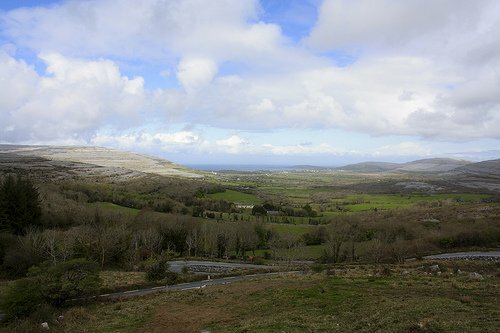 The Burren Center is located in the village of Kilfenora. A beautifully presented educational program, helps visitors discover all of the wonders of this unique part of Ireland’s landscape. The view from Corkscrew Hill in Ballyvaughan is amazing. The gray limestone hills, tranquil valley and Atlantic ocean are mesmerizing. No photo can truly capture the beauty of this landscape. 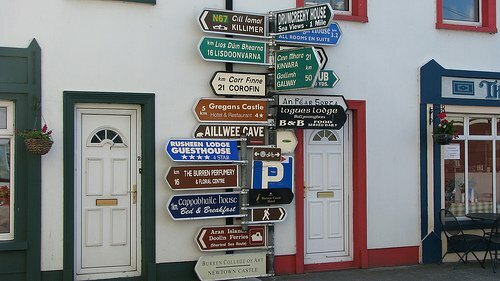 I had to include this photo of a Ballyvaughan signpost. 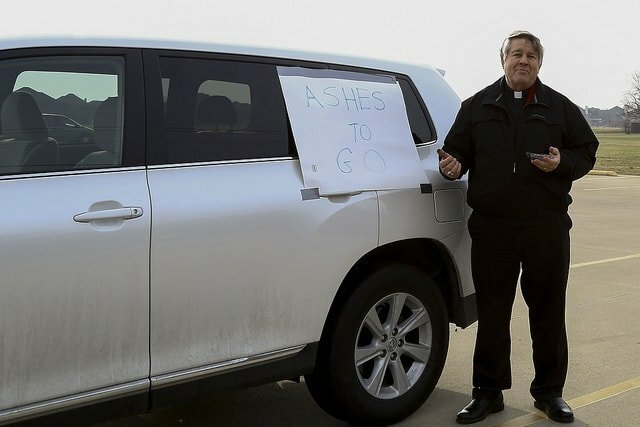 Good luck trying to figure out which way to go! 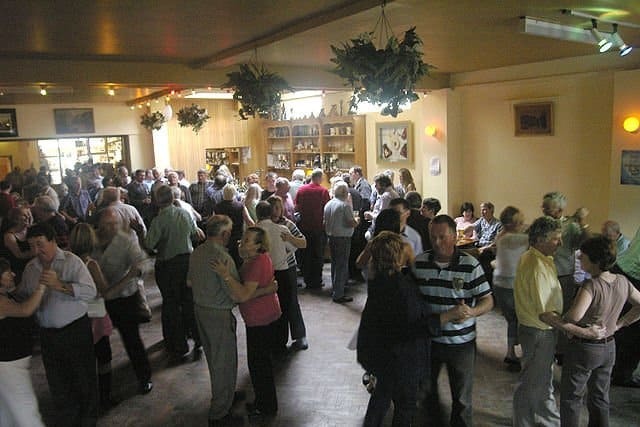 Lisdoonvarna is famous for its Matchmaking Festival, held each year in late September and early October, with dancing, music, socializing and of course the age-old tradition of matchmaking. So anyone looking for a partner, should head to Lisdoonvarna. 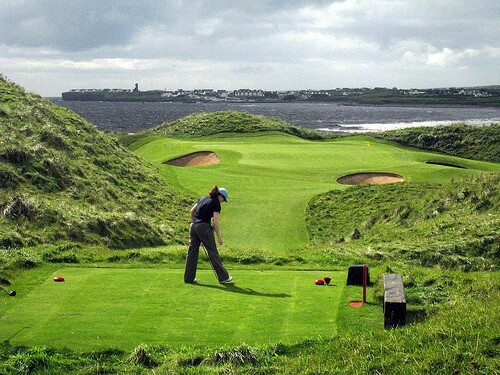 Spectacular golf courses in County Clare test the skills of players of every level. Be prepared for a few lost balls in the Atlantic waves. 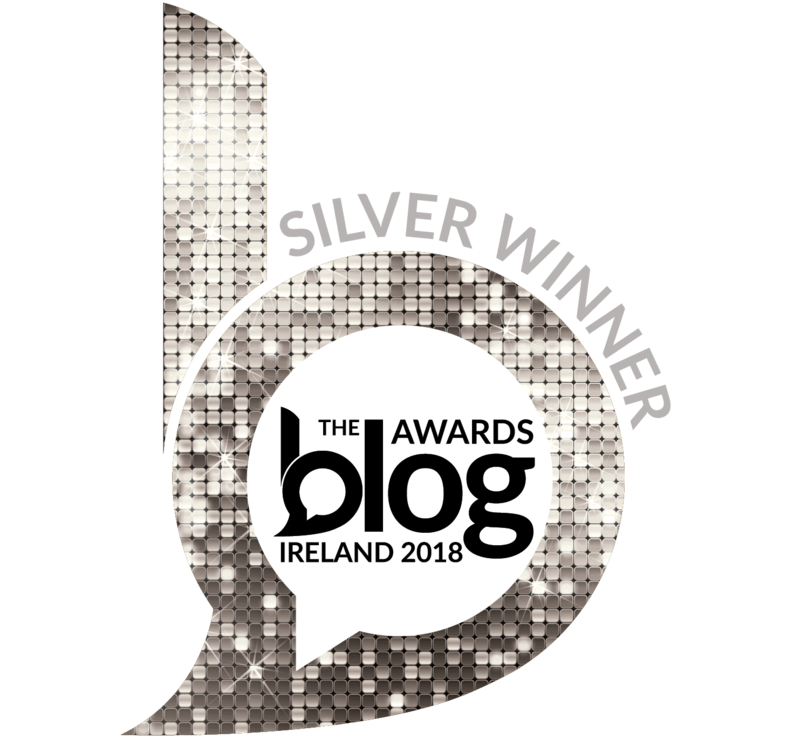 Fishing the rivers and lakes in the east of County Clare is a very different experience to hauling in a catch in the rough waters of the Atlantic. Fishing guides and instructors are available throughout the county. 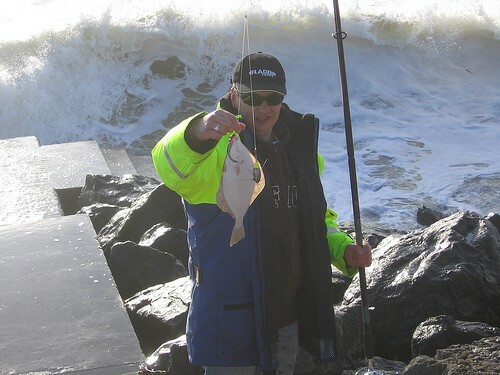 An extensive list is available on the Fishing In Ireland website. 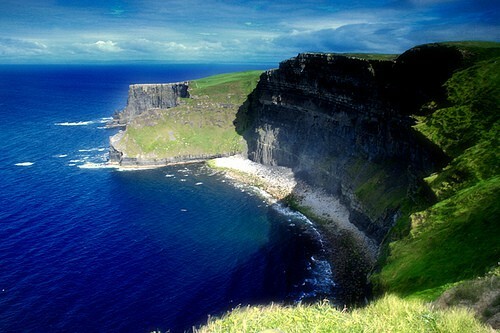 The Atlantic coastline of Co. Clare offers world-class waves, making it amongst the world’s best big-wave destinations. Information on County Clare surfing is available on the Shannon Region Trails website. Once again, I have only been able to bring you a small taste of what County Clare has to offer. Here are some great sites to help you plan a visit to this beautiful coastal county. Wishing you all happy travels in County Clare.